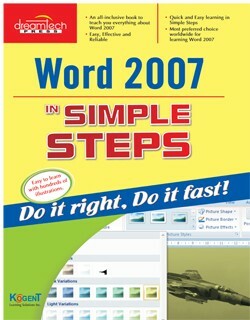 Word 2007 in Simple Steps is a book that helps you to learn WORD 2007, the latest offering from Microsoft. 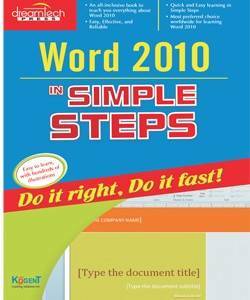 Being precise and complete, it offers the reader a cutting edge in the field of Microsoft Office. With an easy to understand style, lots of examples to support the concepts, and use of practical approach in presentation are some of the features that make the book not only unique but also provides a sort of limited edition look to the book. 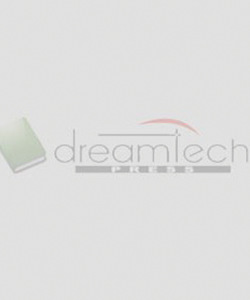 The proficient team at Kogent Learning Solutions Inc. and Dreamtech Press has seized the market of computer books bringing excellent content in software development to the fore. The team is committed to excellenceexcellence in the quality of content, excellence in the dedication of its authors and editors, excellence in the attention to detail, and excellence in understanding the needs of the readers.